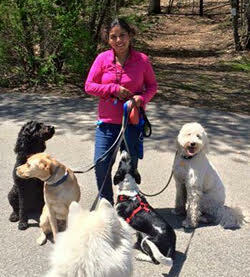 Bark and Stroll Doggy Services Your dog is part of our family! 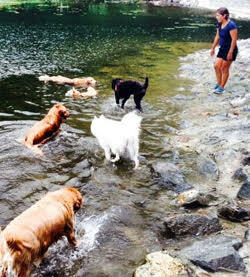 Welcome to Bark and Stroll, a caring, nurturing, and engaging environment for your dog. We offer walks, playgroups and daycare along with pickup and drop-off services. We offer both private and group walks with a member of our devoted staff. Dogs of all ages accepted. An interview is required before signing up for walks. Drop-off and pickup can be arranged for an additional fee. Playgroups and daycare day take place at our home in Newton in a crate free environment with fenced back yard. Dogs are taken for an adventure walk every day. Rainy day playgroups will be held in our attached garage. A member of our devoted staff carefully supervises all walks and playgroups. An Interview is required before joining group. Fourth of July and Labor Day. The health and safety of the dogs in our care is of utmost importance to us. Please let us know if your dog has any health issues that would impact his or her stay with us. Examples include: injuries, recent surgery/stitches, skin conditions, illness, history of seizures, allergies, etc. 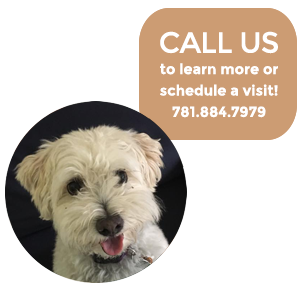 We will do our best to accommodate any special health needs your dog may have. Dogs with contagious diseases or parasites are not allowed at Bark and Stroll. We are happy to provide care for injured dogs or those with special medical or health needs, but for the safety and health of other dogs in our care, we cannot accommodate dogs with contagious diseases or parasites. Common diseases or parasites include, but are not limited to: bordetella (kennel cough), conjunctivitis, and intestinal parasites/worms. Symptoms of disease include: coughing, vomiting, diarrhea, discharge from the eyes, nose, mouth, and/or visible parasites in the stool. The dog is welcome to come back to Bark and Stroll only after a veterinarian establishes that he/she is healthy and free of disease or parasites. © 2019 Bark and Stroll Doggy Services. All Rights Reserved.